Charles “Chuck” Spalinger, age 71, of Clinton, died August 18, 2018, at the VA Hospital in St. Cloud, MN. Memorial services will be held on Friday, August 24, 2018, at 1:00pm at Trinity Lutheran Church in Clinton, MN. Visitation will be held one hour prior to services on Friday at the church. Minister Bev McNeill will officiate and inurnment will be in the Clinton City Cemetery. Charles William Spalinger was born on January 28, 1947, in Clinton, MN, to Elmer and Caroline (Martes) Howen. After the passing of his biological father, Caroline married Clarence Spalinger. Chuck was adopted by Clarence and also gained a brother, Harlyn. Chuck was raised in the Clinton area and graduated from Clinton High School in 1965. On September 2, 1967, Chuck was united in marriage with Janet Longhenry. Together, they raised two boys on the farm. 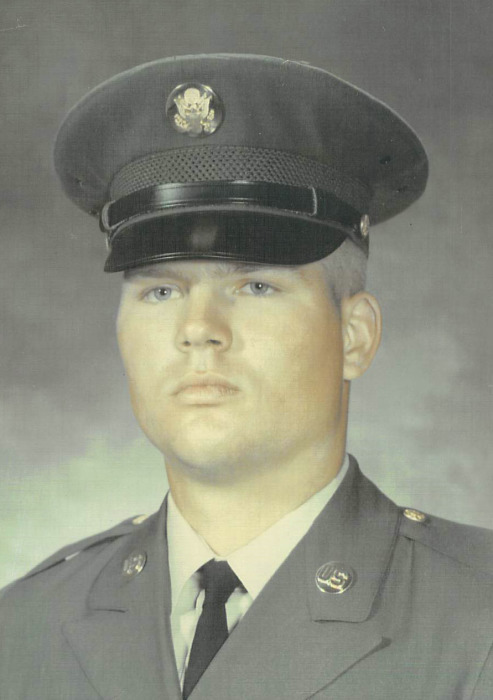 In June of 1968, Chuck was inducted into the Army. He specialized as a welder and served in Vietnam with the 509th Engineer Company 937th Engineer Group. He earned several awards, including three Bronze Service Stars, Good Conduct Medal, National Defense Medal, Marksman Badge, Expert Badge with rifle, and Sharpshooter Badge. Chuck was honorably discharged from the Army and returned home in 1970. Chuck grew up a farm kid and continued to farm to earn a living after returning from his service in the Army. He had his sons to help him in the field and taught them how to drive combine during harvest at a young age. Chuck also gave his grandkids driving lessons around the farm when they were a young age. Chuck was a collector of antiques, such as tractors, engines, and firearms. He spent many hours cleaning and reloading firearms for his collection. He also built many wood burning stoves and even used them in his own home. Chuck loved to hunt pheasants and deer during the fall hunting season. He also had a love for motorcycles and taking long trips with Janet on their Honda Goldwing. They took many trips together: staying in a tent during the nights and sightseeing during the days. Chuck is survived by his wife, Janet of Clinton, MN; two sons: Brian (Jennifer) Spalinger of San Antonio, TX and Pat (Erica) Spalinger of Monticello, MN; five grandchildren: Nick, Alyssa, Amber, Justin, and Tyler Spalinger; brother, Harlyn (Jeanne) Lund of Atlanta, GA; aunt, Gladys Howen of Ortonville, MN; numerous nieces and nephews; and many other family members and friends. Preceding him in death are his parents; his grandmother; and parents-in-law, Ervin and Marlys Longhenry.